Rainford Tennis Club's Adam Ashton is over the moon at the prospect of sharing a court with the likes of Novak Djokovic and Andy Murray after being handpicked by Boris Becker at the Barclays Ball Kids National Trial. 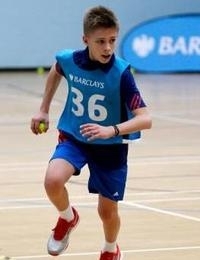 The 13-year-old Rainford High School pupil fought off competition from 99 other young hopefuls at the trials in London, winning a place as one of 30 ball kids to star at Barclays ATP World Tour Finals at the O2 in November. Ashton was tested on agility, endurance, ball skills, balance, speed and team work in the capital and clearly did enough to impress Becker and Sky Sports commentator Mark Petchey. Adam admitted he is now counting down the days until he gets to rub shoulders with the likes of Djokovic, Murray, Roger Federer and Rafa Nadal. “The trial was really good but really hard work but well worth it to get through in the end,” he said. "I just love the World Tour Finals because it’s the top eight players in the world and the standard of the tennis is so high. It is amazing to think that I will be one of the 30 ball kids to be there, I can’t put the feeling into words."